The whole point of observation in the context of policing is so that we are able to make sense of what’s going on in real time rapidly changing conditions. We make situational assessments in the midst of uncertainty as circumstances ebb and flow through our minds that we interpret based on our life experience and the unfolding conditions we now find ourselves in. The patterns we recognize make sense to us and hence we are capable to responding accordingly. However what if the patterns we are observing does not make sense? How do we interpret these patterns some recognizable, some not, into a message that makes sense to us so we can respond effectively? Boyd called this ability to gather information from the various domains and make sense of them, building a new reality based on the current conditions or what we in policing call “real time situation awareness” the crucial aspect to winning. From Robert Coram’s book “Boyd, The Fighter Pilot Who Changed The Art of War” he describes Boyd’s favourite example of “building snowmobiles” which should help those not familiar with the idea that stems around the important notion that a relationship exists between the observer and what is being observed and you analysis and synthesis of it. “Imagine four separate images. Let’s call them domains. Each domain can be easily understood by looking at its parts and at the relation among the parts. Boyd’s four domains were a skier on a slope, a speedboat, a bicycle, and a toy tank. Under “skier” were various parts: chairlifts, skis, people, mountain, and chalets. He asked listeners to imagine these were linked by a web of relations, a matrix of intersecting lines. Under “speedboat” were the categories of sun, boat, outboard motor, water-skier, and water. Again all were linked by intersecting lines. Under “bicycle” were chain, seat, sidewalk, handlebars, child, and wheels. Under “toy tank” were turret, boy, tank treads, green paint, toy store, and cannon. Now Boyd showed how synthesis was the basis of creativity. He asked, ‘From some of the ingredients in this sea of anarchy, how do we find common qualities and connecting threads to synthesize a new and altogether different domain?’ Few people ever found a new way to put them together. Boyd coaxed and wheeled but eventually helped the audience along by emphasizing handlebars, outboard motor, tank treads, and skies. Take these domains Boyd mentioned and change them to domains that fit policing, car stop, domestic violence, active shooter, and natural disaster and then add their existing parts. A short analysis of each will show commonalities and sense making takes hold. Toss a walking talking and thinking adversary into the equation or in the case of a natural disaster numerous ground zeros spread across the wake of a violent storm and uncertainty and disorder become the main characteristics and we must explore the situation more deeply for sense making and an effective response. To make sure the new reality is both viable and relevant, Boyd said it must be continually refined by verifying its internal consistency and by making sure it matches up to reality. This is why our ability to, observe, orient, decide, and act while exploring every situation from start to finish is so critical. My good friend and fellow Boydian thinker, integrity psychologist Michael G. Moore has a very interesting post elaborating on Col Boyd’s and Alexander the Great’s, ability to build snowmobiles and flourish in the worst of conditions. Something I think us cops all need to create and nurture. I hope you enjoy and learn from his piece, I did. Alexander’s snowmobile was in his head …and in his troops’ heads. With this concept, they showed fluidity and innovation …and so can we. ‘It does not have to be that way’ – teaches Boyd’s Snowmobile. Skis are not just for the piste; outboards not just for boats; handlebars not just to steer bikes; and tracks not just to help move machines over earth. Each can become something else. 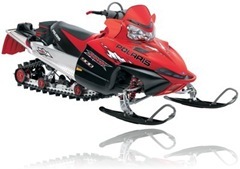 Detach and rearrange them into a snowmobile and each element takes on something new: skis for flat surfaces; outboards to power these skis; handlebars to steer this machine; and tracks to grip the snow. Stick to what something was made for and you have doctrine. Innovate and you have doctrines (plural): fluidity. And this message is just what Alexander got, from Aristotle – who called it “actuality and potentiality”. Meeting the enemy head-on is what actually happens in many stalemate conflicts. Create an out-manoeuvre (what a head-on can potentially become) and you can win. Alexander did just that at the Battle of Gaugamela and won, out-manoeuvring Darius, despite being vastly outnumbered and outgunned. When Watertown Police Officer Joe Reynolds saw the Boston bombers leap from their car and shoot at him, he reversed his car …to avoid being shot. It is easy simply to think “get the bad guys” and actually keep driving forward. In future, police cadets may well be asked: “what else could he have done?” Answers like: “turn the patrol car into a fireball (by getting out and shooting at the petrol tank)”, “drive onto the kerb (or nearby mound) to obscure yourself as a target” are all potential alternatives; fluid innovations which will confuse, disrupt and surprise your opponent. No satisfactory image exists of “actuality and potentiality” (act and potency, for short). Even the Eastern yin-yang symbol can be misread as “going round in circles”. 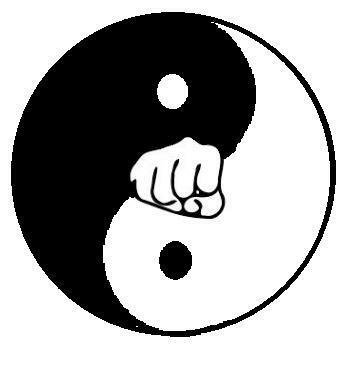 That is why so many martial arts clubs add a fist to it, to give it some form of direction (see right). And, the final goal for the direction of all such fluidity and innovation is simple: victory over your opponent – at all times, in all places, whatever the resources you may have or lack. Let’s say one of our cadets looked at Reynolds’ scenario above and gives the answer: “put the convict I have in the back seat in the line of fire”. Do we permit this? Stay quiet? Say something? My guess is that the training academy would say something along the lines of ‘duty to the public’ – and include a convicted criminal in the definition of ‘public’. A police officer would survive, the cadet could be told, but he would have lost his integrity. A conflicted policeman cannot flourish …for long. Even if his fluid and innovative suggestion is lawful (unlike the above cadet’s misuse of his prisoner), he would have lost his integrity - if this suggestion conflicts with something deeper. Alexander knew something similar. So did his men. Aristotle taught this as the “natural law”. How to make that “intuitive within ourselves”, though, is for another article to address. BIO: Michael G. Moore coined the term "integrity psychology" to describe his approach to personal and corporate development. Informed by the work of George Kelly and Neuro-Linguistic Programming, integrity psychology helps to remove the two obstacles to success (namely those found within (1) the person and (2) the chosen life-pathway), thereby resolving the conflicting parts within individuals, couples, groups and organisations. Having applied this approach’s principles to his own career, Michael separated his income from his profession, in the late 1980s, to minimise, if not remove, all possible perceptions of a conflict of interest. Over the years, Michael, an associate at performance consulting firm, BigBlueStuff, has presented his approach, inter alios, to schools (he is a governor at his local primary school), adult education groups, the military and global organisations. Fun Fact: An 8-year-old Michael once policed his hometown (with family and neighbours), when crime was on the increase in Rangoon, Burma. "Don't know what scared the robbers more: my father's British Army service revolver or my neatly-starched, short pants," he adds.